Home security is an important consideration no matter where you live. Finding the right security company for you is hard enough—finding one that operates in your province can be even tougher. 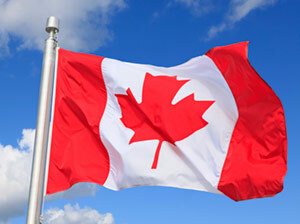 We’ll tell you what security companies in Canada are the best and which provinces they service. This article dives into the top five security companies that service Canada, what their strengths and weaknesses are, and what you need to know to make the right decision about home security. If you want to know who the top security company is no matter where you are, check out our comprehensive review of the 10 best home security systems. Frontpoint is one of our top systems for home security in both the US and Canada. The company offers easy installation and goes above and beyond with customer service, reliable monitoring, and a slew of home automation services. Frontpoint’s three packages provide an affordable option for every price point, and its customer service and 30-day risk-free trial are icing on the cake. If you decide to move but you’re still under contract, it’s easy to transfer your system from one location to another. Frontpoint’s customer service routinely ranks as some of the best in the industry, so if you have a question, you should have no trouble getting the help you need. Best of all, Frontpoint is available in every Canadian province and territory besides Quebec. This makes it one of the most widely available security companies in Canada. Vivint is available in nearly all Canadian provinces, making it an excellent choice for just about anyone in Canada seeking a reliable home security company. Among Vivint’s strengths is the quality of its equipment, which the company produces itself. This results in a higher price, but also higher quality. The addition of a lifetime warranty (as long as you remain a customer) and adjustable monthly costs make Vivint a strong contender. The company recently restructured its business model, simplifying the process. If you can’t afford the equipment out of pocket, it can be financed and tacked onto your monthly monitoring costs. Alternatively, you can pay up front and forgo any contract and pay month to month for monitoring. Vivint can also sometimes use equipment you already have. ADT is available in every Canadian province, which was a huge factor in it making it into our top five. After all, it doesn’t matter how effective a security company is if its customer base is severely limited. Among ADT’s strengths is the fact that it’s a well-known and established company. Studies have shown that the presence of a security system alone deters crime just as effectively as nearly anything else, even if the system isn’t fully active.1 ADT is a large company with more than 100 years of experience, which lends strength to its deterrence. That said, we have a few concerns. For one thing, ADT isn’t the most budget-friendly option. The packages are reasonably priced, but expect installation fees and a few other extra costs. With longer contract lengths and high monthly monitoring prices, ADT is a good company, but it can place a strain on those who aren’t financially sound. Finally, ADT uses independent salespeople to sell and maintain the systems, so depending on where you live, your experience with the company can vary wildly. While the other companies on this list serve both the United States and Canada, Chubb Edwards is unique in that it services Canada only. It is the result of the joining of Chubb, a security company, and Edwards, a fire safety company. While the company has grown to a global scale, there are 28 offices across all Canadian provinces, meaning you’re never far from service. Chubb Edwards provides multiple ways to connect your security system to the monitoring station, using a proprietary system called Chubbnet to ensure maximum uptime on the security servers. While the company doesn’t produce its own equipment, Chubb Edwards uses equipment from United Technologies, GE, and similar companies. It also excels at fire safety equipment. One thing you should be aware of is the customer service. Chubb Edwards consistently receives less-than-stellar reviews regarding the cancellation policy and the amount of time it takes to get in touch with someone. Many customers are unhappy with costs and their experience with the company. While the companies listed above are our top five picks, a few other Canadian security companies may be a good fit for you as well. AlarmForce is one of the largest home security companies in Canada. The company offers four bundle options to choose from, starting at $29.99. The company also offers other services, like the VideoRelay surveillance system and the AlarmCare medical alert system. For an additional fee, you can get the services of a personal, private security guard who will inspect your home whenever an alarm is triggered. If this guard detects signs of a break-in, they will contact police. What kept AlarmForce out of our top five are a poor customer service reputation, limited equipment selection, and lack of online transparency. AlarmForce services Ottawa, Edmonton, Calgary, Vancouver, Montreal, and Toronto, but the company is growing quickly and already has more than 140,000 customers across Canada. With more than 25 years of experience, DSI Security has learned a few things. The company gets its equipment from Honeywell, and the vast majority of equipment is as up to date as it can be. DSI Security is available only in Manitoba, restricting its availability to a much smaller number of customers. Trained technicians professionally install all DSI systems, and the connections primarily rely on a landline to communicate with the monitoring station. However, cellular connections are also available, though less common. DSI Security didn’t make our top five recommendations due to its limited service area. Unless you live in Manitoba, there’s not much this company can do for you. No matter where in Canada you live, crime can happen, which is why we took each company’s availability heavily into consideration. In general, the eastern provinces have the lowest crime rates, while the western provinces tend to have a bit higher rates. The territories have the highest rates of violent crime, although Manitoba has the highest robbery rate of any province, with 168 robberies per 100,000 people. Saskatchewan is the second highest, with a rate of 95 robberies per 100,000 people. If you’re a resident of Canada, take the time to read over this list and check out some of our more in-depth reviews for the best security companies that operate in Canada. Figure out what you’re most concerned about and work from there. For example, if your neighborhood has seen a rash of garage break-ins, a system with a garage door sensor might be the best fit. Be sure to evaluate your unique needs to help you determine which security company will work best for you.